Take children on a field trip to a barn in order to bring home more strongly the harsh reality of the humble circumstances of Christ's birth. Advent was drawing toward its close, and we were discussing it all over again and suddenly one of the children said, as though really hearing it for the first time: "But — barns are so smelly!" Yes, aren't they? He was in a sheep cave where in rainy weather the shepherds brought their sheep to shelter. Sheepfolds are not the most fragrant places in the world. There is the smell of dung, the mustiness, the heavy oily smell of wool; and these caves were infested with vermin. The child pondered this thought often and deeply. Later at a catechism lesson her answer to "Where was Jesus born?" was truly anguished: "In a dirty old, smelly old barn!" Suppose our baby were to be born in a barn? They were beside themselves. No — never. The bitterness of it all: little Lord Jesus born in a barn. . . . They had penetrated the sweet coating on the story and tasted the sharp suffering beneath. That He should come to us this way . . . incredible! Hay is not so soft as we think. We would see, if we were to take our children to the countryside where there may be sheepfolds, cows in stalls, hay in barns. The sounds and smells of barns, the steamy breaths of animals, the never-ending munching — this is no place for a baby. We have spent our energy on far less appropriate trips, trips to see Santa, trips to see Toyland, trips to movies and theaters and entertainments, all because it is Christmas time. These are diversions but not the true joy of Christmas. They divert our gaze from Christmas, not to what Christmas really is. Such a strange custom, celebrating Christmas and not knowing why. Much of the world does not know why — and that is very sad. There is only one reason in all the world to feast and be merry at Christmas: because we are redeemed, and Christmas is the feast of the beginning of our Redemption. 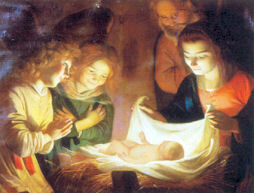 In this bewilderingly beautiful season, in a most mysterious and beautiful way, God became a Baby.